Fathom Events has announced their partnership with the Jim Henson Company and Sony Pictures to bring Labyrinth back to the big screen in a special 3-day event. Though the movie debuted at number 8 at the box office upon its initial release in 1986, Labyrinth went on to become a cult favorite. The movie stars musician David Bowie and Academy Award Winning actress Jennifer Connelly in one of her earliest roles. While their performances were not praised by critics during the original theatrical run, new reviews have gone on to applaud the work of both Bowie and Connelly. The new 3-day special screenings of Labyrinth will take place on April 29th, May 1st, and May 2nd with fans being encouraged to come dressed up in costume as The Goblin King and other iconic characters from the movie. As with most Fathom Events screenings, the movie will come with bonus features. Introductions by Jennifer Connelly and Jim Henson's son, Brian Henson will start off the feature, as well as an excerpt from the Jim Henson fantasy series The Storyteller. Brian Henson will be talking about the Soldier of Death episode of the series and discuss the special effects used in both The Storyteller and Labyrinth. The special screenings will be available starting Sunday April 29th, with two times to see Labyrinth, once at 2pm and then 7pm (local time). After that, the remaining showings will be at 7pm during the week. Tickets will go on sale online starting this Monday, February 26th. In a statement, Fathom Events vice president of studio relations, Tom Lucas, spoke about his excitement to bring the cult classic to theaters again. He had this to say. "Labyrinth is one of the most frequently requested titles, and has an enormous fan base. It's a film with great appeal to a huge audience, and also a cinematic experience that can be enjoyed over and over, always revealing more surprises. We couldn't be happier to share it with moviegoers again." David Bowie used to say that he was shocked at how many children and adults came up and recognized him as Jareth, the Goblin King. Jennifer Connelly has said the same thing, adding that girls come up to her at the most random places to say that they know her as Sarah. 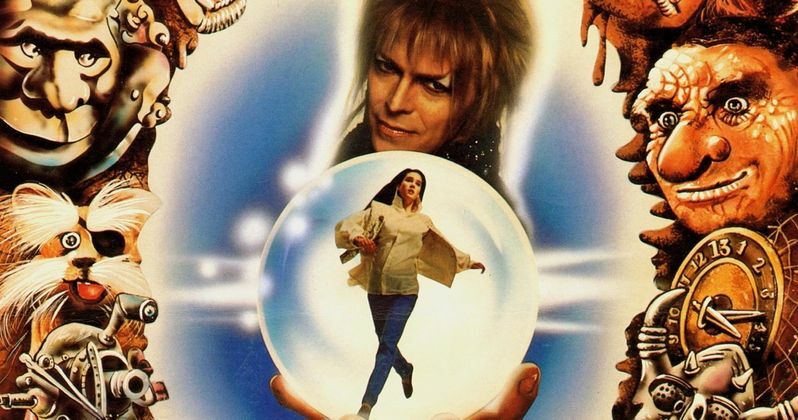 Labyrinth might have only made half of its original $25 million budget in theaters, it took off on the home video market and has been repackaged a handful of times. Most recently, a 4K Blu-ray edition was released in 2016 to celebrate the 30th anniversary. Ahead of the 3-day special screenings of Labyrinth, Fathom Events is screening The Dark Crystal for a special 3-day event starting this weekend. The 4K transfer will be shown on the big screen along with more bonus content from the Jim Henson Company. The last special screenings of Labyrinth took place in 2016 for the 30th anniversary and many sold out, so don't sleep on getting tickets. You can get more information for both screenings by heading over to FathomEvents.com.